This is an incredibly large building that has mainly been designed as a garage, though it would also be suitable as a good sized workshop. Its attractive design will look great alongside any style of house from the ultra-contemporary to the chic traditional abode. 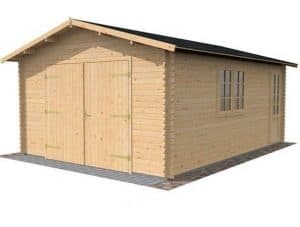 Designed with 35mm double tongue and groove cladding, the building is capable of withstanding a heavy level of wear and tear and comes armed with a 10 year anti-rot warranty. It also offers a range of customisation options, making it possible to invest in a building that fully meets your needs. There are some pretty good security features included such as the key and lock on the large double doors and the single glazed windows. The fact this garage comes with windows means it supplies a generous amount of natural lighting. As with a lot of outdoor buildings, this also benefits from the stylish and traditional looking apex roof. Waltons have even provided an additional benefit of an over-hang feature. 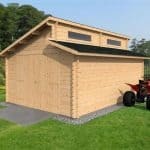 This increases its water protection, ensuring any rainfall runs off the shed before it has an opportunity to run down the sides and front of the cabin. Overall it is a very high quality garage that offers a sensational amount of space and excellent value for money. 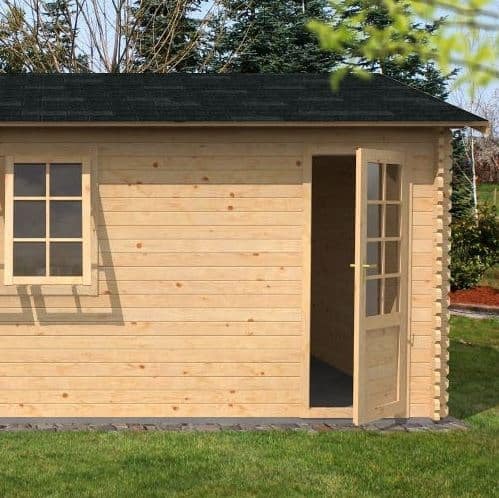 While we do feel we should point out the high initial purchase price of the cabin, we also feel we should highlight the value for money you are receiving. Taking into account the entire features and benefits of the building, the high initial cost works out as more of an investment in the long term. This is a generous sized log cabin that has been primarily designed as a garage. However, it would also make an excellent workshop or a general storage facility. 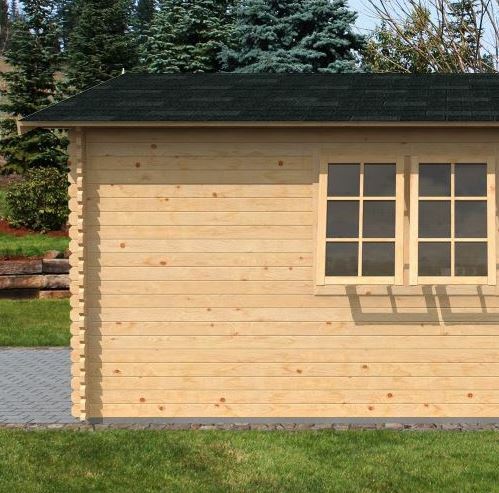 Benefitting from a gentle sloping apex roof, the cabin provides excellent natural water-drainage. As rainwater falls onto the roof, instead of gathering and festering on top, it will run down and away from the garage, onto the floor. This really helps to prevent rot and other damp-related problems. Of course, you also get the height increasing benefits that come with an apex roof design. The width of this building is fantastic, measuring 4.20m. The depth is also pretty large at 5.70m. So you will need a good sized space to assemble it. In height it reaches 2.75m from floor to roof and 2.18m to the eaves. The doors also have an incredibly spacious design measuring 2.40m wide and 2.01m high. Overall it’s an impressively large building that will easily accommodate a family size vehicle, or provide exceptional workshop space. 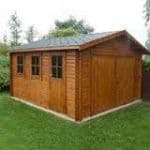 Being a log cabin, you can expect the thickness of the cladding to be fairly substantial. It benefits from interlocking tongue and groove cladding which measures a staggering 35mm thick. To put that into perspective, a standard wooden building is typically designed with around 12mm thick cladding. It is considered exceptional quality if the cladding is 16mm thick. So the fact these logs are 35mm thick show just how durable this building will be. It actually features double tongue and groove cladding so you really won’t need to worry about the quality of this building. Obviously as the exterior cladding is so thick, it needs a strong, supportive frame to withstand its weight. 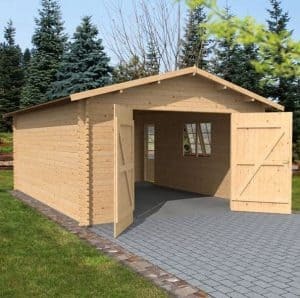 The manufacturers have covered this and have also provided corner joints and chalet connections for added rigidity as well as strength. Like a lot of garages, this one doesn’t come with a floor. This is actually a positive thing as it means less work when it comes to installation and you also don’t have to worry about what you’re storing. However, you will need to ensure you build it on a very solid surface. Concrete is preferable, but paving slabs could also work providing they are level. 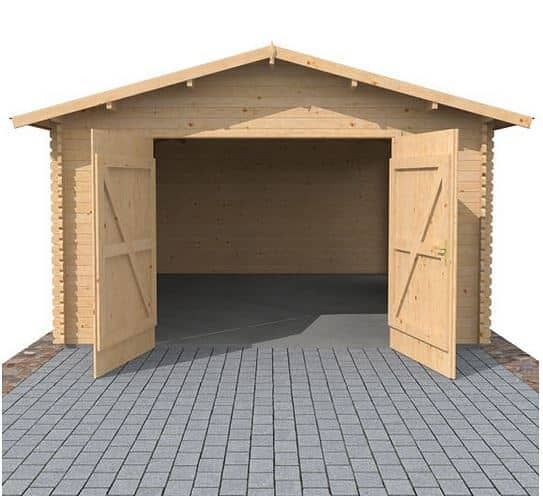 In order to ensure the garage lasts as long as it should, you will need to use a good quality timber treatment after you’ve put it together. This will also make sure you are protected by the included 10 year anti-rot warranty. It is also important to note that you will need to continue to treat the cabin, usually on an annual basis, in order to maintain its warranty. Spirit based treatments are the best option as they do offer a much better weatherproof barrier. Some even protect the building for longer than a year, meaning you will save money in the long term. However, this is something you will need to check in the treatment manufacturer’s instructions. There are actually three doors included with this garage. The main double doors are located at the front of the building and they provide an incredibly spacious access point. They are also protected with thick cross-beams, ensuring there is no risk of them sagging over time. The other single door is located at the side of the building. This is a good feature as it ensures you can gain quick and easy access into the garage. It also comes with a pretty attractive design too. It features tiny block windows, just like you would find on the front door of a house. What we really like about the doors is that they have been fitted with a lock and key system. So this provides an excellent level of security. There is also one window included with this cabin and like the side door, it features a unique bar design. It is very similar to a Georgian style window and enhances the cabin’s overall design. In terms of practicality, the window also ensures natural lighting gets into the building. However, if you’re planning on using the cabin as a workshop this likely won’t be enough and an electrical pack will be needed. More information on electrical packs can be found in the Customisation Options and Extras section below. We were surprised to see that you can customise the strength of the glass window and door. As standard, the building comes with a single glazed design. So without spending any additional money, the cabin will come with 4mm glass glazing. However, you also have a double glazing option which will provide additional insulation and noise reduction. Again, more information can be found in the customisation options below. You would think that the window would somewhat decrease the cabins security. However, whilst it does limit the amount of privacy the building has, the garage comes with many other features that ensure it is incredibly secure. For example, the 35mm thick logs are a fantastic thief-barrier. Unless a potential thief comes along with a strong axe and they are willing to spend a lot of time and effort hacking their way into the garage, it is pretty much impossible to break through. Then there’s the lock and key doors which ensure the building is kept fully locked when it isn’t in use. 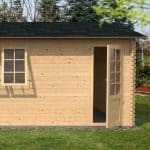 It is these additional features that really make this building one of the most secure log cabins we have reviewed. 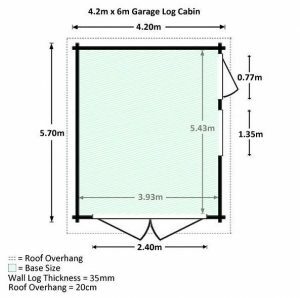 The customisation options and extras available for this log cabin garage are extremely impressive. There is one required customisation option you need to decide upon and that is the type of glazing you want to benefit from. As mentioned earlier, the building comes with 4mm thick single glazing as standard. However, you can also choose to upgrade to 16mm thick double glazing. This thicker glazing provides great insulation, making the building more comfortable in cold, winter months. It also makes it tougher to break, which is great if you have young children as there is less likely going to be any ‘accidents’. Of course, it also makes it difficult for thieves to break through. The roof is another thing you can customise. As standard, you are supplied with a heavy duty mineral felt. This already provides great seasonal protection. However, you also have two extra strength-boosting upgrades available. The first is the Superior duty felt. This is created with fiberglass, rather than minerals and it supplies a very long-lasting protection. You also have a choice of olive green or charcoal colours to further customise the cabins appearance. The second roof customisation option is roof shingles. The Walton’s ArmourShield Shingles are self-adhesive and they come with a very distinctive, fashionable design. Unlike standard roofing felt, shingles overlap to give a more textured finish, similar to that of roof slates. They can be created with numerous different materials, though these ones are created with wood. As they do add an excellent additional level of protection, they are quite expensive. However, the cost is definitely worthwhile for the benefits you receive. Insulation is one of the key issues addressed with the extras available for this cabin. Not only do you have the option to upgrade to double glazing, but there’s also Eco-Quilt Garden Building Insulation kits available. There are two different kits to choose from including 30 square metre and 60 square meter packs. Both offer 6 impressive thermal wadding layers, along with a reflective foil layer and breather foam. Again, if planning on using the building in cold months as a workshop, this would be a worthwhile investment, even if it does come at a fairly high cost. The final customisation option available is solar panels. Now make no mistake, these are expensive! However, they are a more cost-effective option than investing in an electrical kit. As there is only one window included with the building, you won’t benefit from a lot of natural lighting. This means if using it to work in, you would typically have to buy and install an electrical pack. These are not only expensive, but they require expert wiring and will come with long-term running costs. They are the most popular way of providing power and light into an outdoor building as they are less expensive to purchase outright than solar panels. However, solar panels use natural renewable energy to power the shed and won’t cost anything extra once they’ve been installed. Waltons offer five different solar panel options. We like that you can choose from free-standing panels or roof installed panels. The latter will take a lot more effort to install and does come at a more expensive price. It’s also important to note that some of the panels are more suitable for powering small appliances and lamps, whilst others are capable of powering multiple tools and machinery at the same time. The more money you spend on the kit, the more power you will benefit from. We do feel it’s important to state that the insulation packs and solar panels are not covered by the Waltons installation service. So you will need to pay to have them installed separately. It likely comes as no surprise that we have given this cabin a 10/10 rating. It truly is a remarkable, solid and durable building. Yes you may need to treat the building with a timber preservative, but overall the materials used are fantastically durable. This is a garage that will last for a very long time thanks to its super-thick log construction. This garage provides an incredible amount of space, boasting not only great height, but also an extra-wide design. It enables you to comfortably store a family-size vehicle, or can be used as an exceptionally spacious workshop. The thick logs give you the opportunity to also hang heavy tools from the walls, as well as install strong interior shelving. The installation method itself is easy, but it is a very long and heavy labour job. It is advised that 2 people carry out the assembly, but we personally feel 3 people would be a better idea. The logs are very thick and heavy and as such will require a lot of muscle! Yes this is an expensive garage but when you break it down in terms of value for money, you realise it’s actually worth it. You will have difficulty finding a stronger, higher quality garage that offers such incredible value. 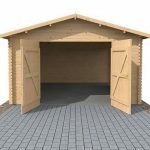 Final Thoughts: Thanks to its corner joints chalet connections and double tongue and groove construction, this garage has a very stylish as well as a weather-resistant design. Its size makes it ideal for storing practically any vehicle, whilst also enabling you to use it as a large workshop. We really like that you have a few customisation options which can help to make the garage better fit your requirements. We’re also impressed by its overall security and value for money. Whilst an apex roof is a pretty common feature on most outdoor buildings, this one also benefits from quite a big overhang to further boost its water resistance. It’s these unique features that really help this garage stand out.